All this month I have been making recipes dealing with the leftovers from Engineer's brewing process. Why is that perfectly practical you ask, I'll tell you: nothing goes to waste. 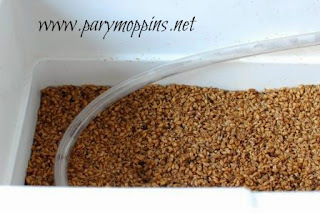 I've shown you how to dry out spent grains, then make granola, muffins, & breakfast cake using those grains. I still have a few more recipes up my sleeve...stay tuned. Why would I even bother to take the time to dry out the grains for reuse? Mainly, it keeps the cost per bottle down. Basically all those 12 lbs. of grains are used for is to make a flavorful "tea" if you will, to be fermented. They get steeped then tossed if you don't swoop in and save them. Using spent grains works for me.